We often see advertisements for independent financial advice, independent travel advice, independent health coverage, independent real estate brokers, independent schools, but what does it mean when we say we offer independent engineering/consultancy advice to our customers? Maybe we should start with a suitable definition of INDEPENDENCE. In this context it means “not influenced or controlled by others in matters of opinion nor subject to another's authority or jurisdiction.” But how does that translate into practice? The landscape of the oil and gas market has changed beyond recognition from when I first entered it as a young engineer in 1978. It was a truly bountiful industry with a huge array of players providing engineering services, construction support, manufacturing capability or resource management. It’s been through a number of economic cycles and periods of real turmoil which has led, by necessity among other things, to the formation of a number collaborations, joint ventures and partnerships which offer a “one stop shop”. Supposedly these partnerships will keep development costs down but how do we know that’s true and is cost the overarching priority in all cases? Where does VALUE ADDED feature in this era of relentless pressure on removing costs in everything we do? We might chose to define VALUE ADDED as “additional services and skills that go beyond what is traditionally expected that provides something “more” to a customer, even if the cost is higher”. 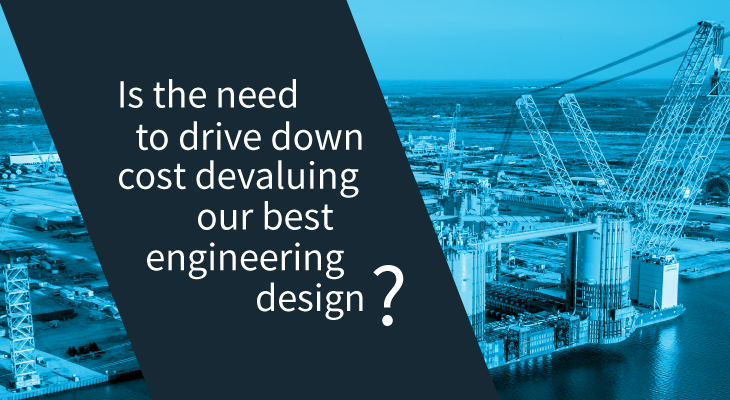 In the overall scheme of things engineering is unquestionably cheap compared to other costs but we often find ourselves being pushed down the food chain and our INDEPENDENCE is at risk of being devalued whereas it should be considered as VALUE ADDING. Those sophisticated customers and decision makers we deal with appreciate this concept but regrettably it’s not true for all those in the long and oftentimes unfathomably demanding supply chain. After all, if you wanted to have some dental work done you wouldn’t go to an orthodontist who threw in brain surgery for free would you! That’s hardly adding value and probably not the best decision to make. You’re likely to pay the extra money to get it done independently by those who specialize in grey matter and undeterred or influenced by what your teeth look like. You’d also want the very best treatment and be offered the very best drugs available, not necessarily those that are being marketed in the waiting room because there’s some commercial relationship in place. If the “one stop shop” is analogous to the big super markets full of their own brands, my plea to those with cost oversight is to consider “independent value adding consultants” (such as Advisian/INTECSEA/Ingen) as suppliers of artisan goods. You may need to shop around a bit and the costs may be a bit higher (not always) but you’ll get a product specific to your needs that add real tangible value.